Upper two are 24×36″. Bottom two are 18×24″. The images below are available as lustre prints and ready-to-hang canvases. Annual WILD calendar – $25 + shipping; please see here. Looking for a specific species found in the NE Pacific Ocean? Just ask, many more images available! 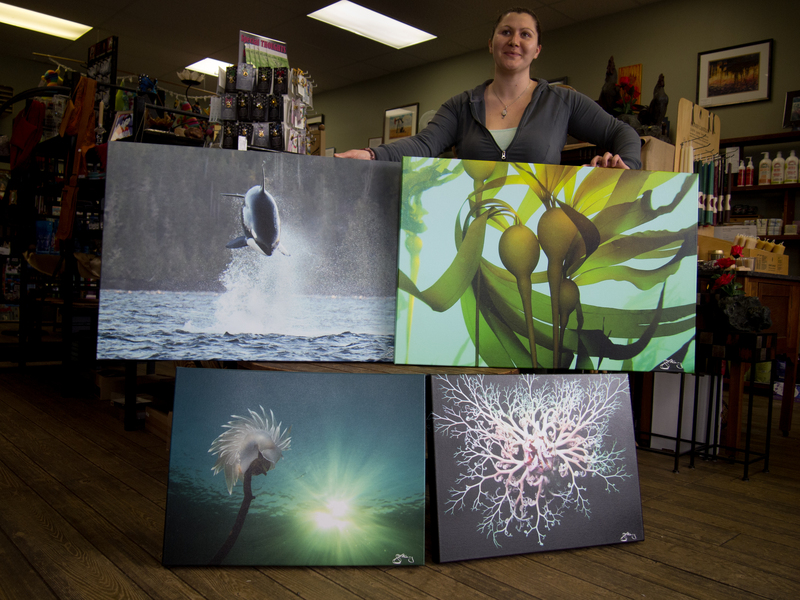 Canvases and calendars sold locally on NE Vancouver Island at East of Java and the West Coast Community Craft Shop. 1. A Mother Hunting – T140 in pursuit of a Pacific White-Sided Dolphin. Mammal-eating Killer Whales diverged from other populations ~700,000 years ago. 2. Alabaster Nudibranch on Giant Kelp (horizontal) at only 3 m depth; species to 18 cm. So much beauty, mystery and fragility is hidden just below the surface. 3. Bull Kelp Forest (“Family”)- habitat for ~750 species and up to 36 m in length. Marine algae, from the microscopic to these giants, produce ~70% of our O2. 4. Bull Kelp Forest (“Hugs”) – habitat for ~750 species and up to 36 m in length. 5. Pacific White-Sided Dolphin mirrored in the Ocean’s surface. 6. Endangered “Southern Resident” Killer Whales by moonlight. Members of L-Pod passing through our area (inshore fish-eating killer whales). 7. Pacific Harbour Seal surfacing in the midst of a kelp forest. 8. Bald Eagle soaring past mist-soaked Cedars. 9. “Pointer” (A39) – “Northern Resident” Killer Whale; Threatened population. He stayed with his family from birth to death; 1975 to 2014 in the A30 matriline. 10. “KC” the Humpback Whale breaching (#2); born in 2002 and here every year since. We have a 2nd chance with these giants. Whaling only ended in this area in 1967. 11. “KC” the Humpback Whale breaching (#1); born in 2002 and here every year since. 12. Just breathe. “Conger” the Humpback Whale exhaling at the surface. Throat pleats on left and baleen on right; breathing in the very air that you do. 13. Basket Star – surreal looking sea star species; up to 75 cm across. Their 5 arms branch to form an intricate net to trap food. 14. Alabaster Nudibranch – flower-like in appearance. Here at only 3 m depth; species to 18 cm. 15. Rose Star – species to 15 cm wide. A voracious predator that can “race” at speeds of up to 70 cm / minute. 16. White-And-Orange-Tipped Nudibranch – species to 2.5 cm. The number and diversity of the sea slugs in these rich waters is awe-inspiring. 17. Purple-Ringed Topsnail – species to 4 cm wide. Brilliant ambassador for the colour and biodiversity of the NE Pacific Ocean. 18. Lion’s Mane Jelly drifting by a wall festooned with life. Species can be 2 m wide with 150 tentacles that extend to 9 m.
19. Giant Pacific Octopus out hunting. Hooded Nudibranchs around him/her. ©Jackie Hildering; themarinedetective.ca. 20. Giant Pacific Octopus using Giant Kelp as a hammock. Hooded Nudibranchs are also gathered here – all at only 5 m depth. ©Jackie Hildering; themarinedetective.ca. 26. Bull Kelp just below the surface. 28. Mature Bald Eagle perched among lichen-draped Cedars. 29. We Are Family. 115 Matriline of “Northern Resdients” (inshore fish-eating Orca). 30. Ocean Eye – The eye of a Giant Pacific Octopus in her den. 31. Humpback Whale “Inukshuk” lunge-feeding on juvenile herring. 32. Ochre Stars mirrored against the surface. ￼33. Bull kelp forest (Nereocystis luetkeana). Habitat for +/- 750 species and can grow up to 60 cm/day. About 70% of our oxygen comes from the sea – from these giant algae to the phytoplankton that make these cold, dark, rich waters appear emerald green. ©Jackie Hildering; TheMarineDetective.ca. 34. The other side of the bait ball. ￼ ©Jackie Hildering; TheMarineDetective.ca. 35. Juvenile Giant Pacific Octopus amidst Plumose Anemones. Available as a 20 x 25″ mirrored wrap around 1.5″ stretcher bar for $225. I love the canvas prints! What a beautiful and affordable way to gift yourself or a friend, and support the great work of The Marine Detective! I so appreciate this support Jacqui! Wonderful photos! Such a great way to become aware of our oceans beauty and the need to preserve her. Living together with respect for and in harmony with other species on this planet is my wish for this crazy world. You’re brave Jackie, for making this your life work. I know. Thank you so much for this . . . I am compelled to take the photos and try to make them count and it provides me with such motivation to get indicators like this that they are counting as hope they might. Truly gorgeous! Thank you for all of your good work. Thank you for the great kindness of providing feedback Mary. It serves as great encouragement. Thank you so much for this comment and kindness Carol. I can imagine how strong a connection you feel to the Ocean, having lived upon it! So glad the photos bring it a big closer. Wow! These pictures are a testament to the wonders of the sea… how lovely and thanks for sharing them with us! Exactly my hope Deb – to create awareness of these wonders. Thank you very much for the feedback. Received 2016 Calendar,love it! Problem, which one do we get a print of?!! Thanks for your great work. I so appreciate this feedback? It’s a good shot of motivation for me to keep at it! Each of these pictures speak to me BUT the octupus and the sea lion coming up for air are definitely my 2 favourite. I keep looking at them over and over. Wonderful to hear. The moments captured in those images were so very remarkable.